Suppose that an option has an exercise price \(X\) of $10, the risk-free rate \(r\) is 5% per annum, the volatility of the underlying asset \(\sigma \) is 20%, and that the option expires \(T\) in 1 year. 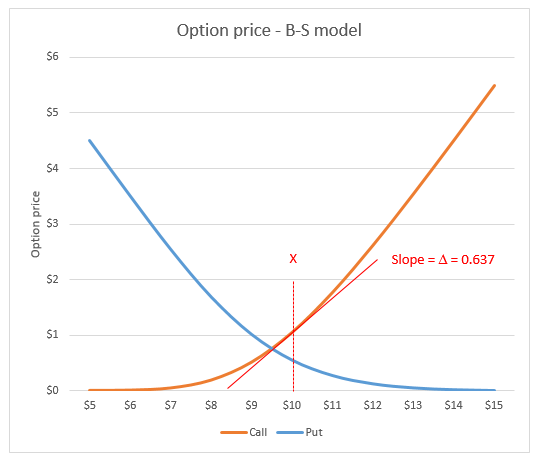 Using equations 1 and 2, the price of a call \(C\) and a put \(P\) option, for stock values \(X\) in the range $5 to $15 is shown in figure 1 \(\Delta = 0.637\). Estimating the slope of the curve from first principles (also referred to in mathematics as the delta method). The x axis is the underlying asset price, and the y axis is the option price, thus, the slope \(m\) is \( \Delta y / \Delta x = (y_2-y_1 )/ (x_2-x_1)\). 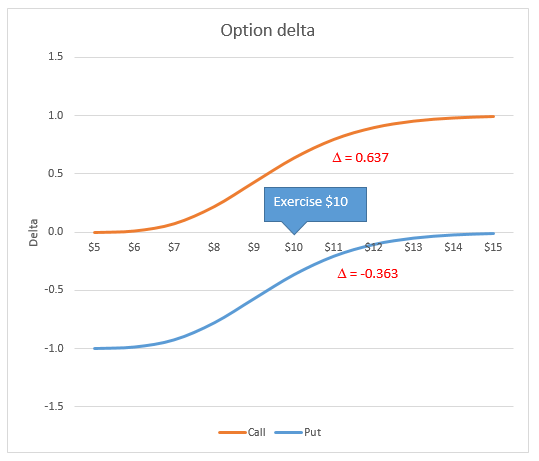 For a plus and minus one cent change in the underlying asset price around the exercise price of $10.00, (preserving Excel accuracy) \(m= (1.05143603612828-1.03869944030321) / (10.01 - 9.99) = 0.0127365958250678 / 0.02 \approx 0.637\). This is the slope \(\Delta \) of the tangent at \(X=10\) for the call option in figure 1. The slope of the put curve can be estimated with the same method \(m= (0.553730281135423-0.560993685310354) / (10.01 - 9.99) = -0.00726340417493088 / 0.02 \approx -0.363\). From equation 3, \(\Delta_C = N(d_1)= 0.636830651175619 \approx 0.637 \) and equation 4, \(\Delta_P = N(d_1) - 1= 0.636830651175619 - 1 \approx -0.363 \). The VBA code is based on material in the Black-Scholes module. Equations 3 and 4 are implements in rows 14 and 15 of the OptDelta procedure. You can copy code from the code panel, or download the xlsm file from the link at the bottom of this module. Black F, and M Scholes, (1973), The pricing of options and corporate liabilities, Journal of Political Economy, Vol 81 No 3 pp637-654. Kwok, Y-K, (2008), "Mathematical models of financial derivatives", 2nd ed., Springer.